You know those spaces. They are the small, awkward spaces in living rooms, kitchens and bathrooms that just seem impossible to utilise or decorate. One of the more notorious spaces is the area under your stairwell. Not quite high enough for a decent bookshelf and a little too small for a proper seating area. 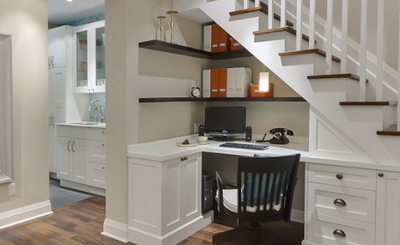 Most people think of these spaces as storage spaces only, and attempt a design for storage. But there are other ways to use staircase corners to add that element of surprise. Here are three. Starting with the predictable and moving toward the more creative and ingenious. This is a fresh take on the coat and hat rack. The advantages include keeping your over coats, winter jackets and umbrellas out of plain view. It also provides a way of keeping the dust off. The materials for this are relatively simple. Most you could pick up from Bunnings Warehouse. They will cut your chipboard to measure on the spot and chances are good that they will have the baskets and cushions. The cost for this design would be around $200 as a DIY job. While this is not an original idea by any means, it continues to be a creative one. Especially popular for working mums who operate their small business from home. It’s not quite a deluxe business suite, but it’s certainly a step up from doing business from the kitchen bench, enabling you to keep an eye on the kids while you work. One of the things I like about this choice is it’s simplicity. Shelving is kept high (which matters if you have a three year old, as I do) and there are no jutting corners to land into when moving around the home. 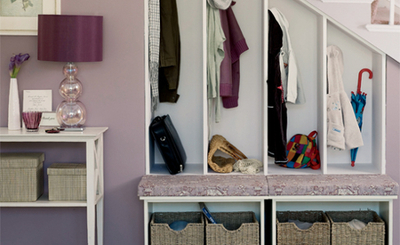 Everything has been kept compact while maximising the small space beneath a staircase. A little more expensive to accomplish as you will probably need a carpenter to custom build the shelving and desk area. Expect to pay around $500-$800 for a really good finish. This one is simply the best. 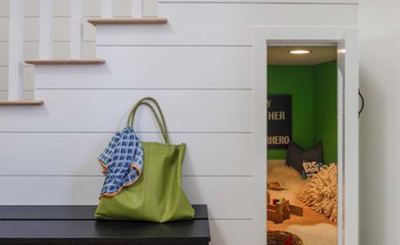 The designer (Von Fritz Design) has turned the area under the stair and beyond into a delightful kids room and play area. The colours are a bonus. Simple Georgian white design with a look that is both solid and easy to maintain. The low roof suggests that the house has been subjected to a number of renovations and add on features over the years and this clever staircase cuby is just one more concept form a clever architect. Expect to pay a few thousand dollars, depending on how far you take the idea. Naturally, this one requires some forethought and planning, as well as the engineering skills of a builder and an architect. But could this be an ideal part of your next renovation? Far from being a place to dump your rubbish or store your cardboard boxes full of last years Christmas presents, that space under your stair really does have some uses. What great ideas can you come up with for your staircase? How Parents Can Finance Their Kids Future?